If you ask someone who is shall we say rheumy-eyed and puffy with allergies whether or not their sinuses feel “lax”, you might get a look that confirms (at least in their minds) that you’re a crazy person. However, if you ask them if their sinuses feel leaky runny drippy sneezy, then they will for a surety answer that they do. It’s not difficult to figure out if you have runny sinuses. There are always leaky drippy fluids coming from the nose and eyes and often drainage into the back of the throat. This drainage can cause sore throats and itchy coughing that is particularly uncomfortable when trying to sleep. The eyes will normally be red, itchy, and runny along with the nose that drips “like a faucet”. Sniffling and sneezing is a common occurrence and one may feel the strong urge to stuff tissue up both nostrils (especially when trying to sleep) for reprieve. In cases like this, the person suffering isn’t going to care how this looks or at least I never do. However, if you poke fun at someone with an especially miserable runny nose, you might just get a soppy hanky thrown in your general direction. Not that I’ve ever done this of course. Seasonal allergies and hay fever are two of the main causes for runny nose or perhaps an over-sensitization of pollen, dust, mold, or animal dander. Whatever the case may be, your body is overreacting because it wants these irritants out of the body. 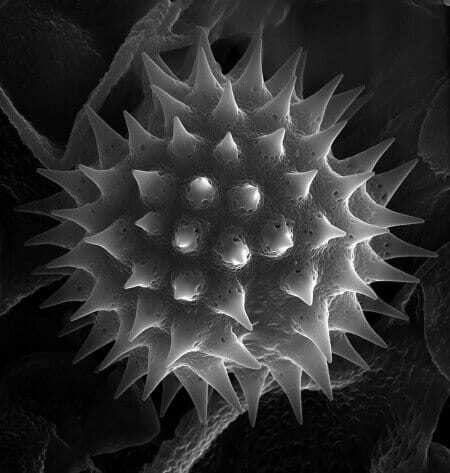 I mean, have you ever seen what a pollen molecule looks like? Look at that lovely picture below…definitely not pleasant. Just looking at this picture makes my nose twitch. Regardless of the root cause of a runny nose, astringent herbs are indicated as they help tighten leaky, swollen, and inflamed tissues. Some herbs, in particular, have a special affinity for the upper respiratory system and are easy to use as teas, tinctures, or even as nasal irrigators. There are a few tried and true herbs that work especially well for runny nose symptoms. These herbs can be made as a tea or used as tinctures, both render great results. In a pinch, you can take them as capsules if needed. ***I should also note that some cool drained green tea bags over the eyes feels particularly soothing if they’re red, drippy, and irritated. For acute situations where a runny nose comes on suddenly and in full force, take one of these herbs as a tea until the symptoms disappear. For those of us with hay fever and seasonal allergies, these herbs will grace our daily regimens for a number of months before full recovery is made. You can read more about my natural remedies for seasonal allergies here. Of course, using a neti pot filled with a saline herbal tea will do the trick very nicely as well. Pour into the neti pot and get irrigating! Astringent herbs like the ones I’ve discussed work on contact so you should feel relief very quickly. This is my favorite type of neti pot for at home and this is my favorite neti pot for traveling. Okay, so hear me out on this one! Since I have switched to using handkerchiefs my allergies have decreased tremendously because as it turns out I’m allergic to tissues. When dealing with a runny nose, I highly encourage you to try it out especially if your runny nose set on after being exposed to pollen and other irritants. Trust me, give it a go! You can get them HERE in a variety of different patterns and colors. What have you used to staunch a runny nose? I have yarrow all the time on hand, it’s a favorite. never thought about using it for runny noses, but sure will next time we have one! I have astuffy nose as I type! Sore throat too. Thanks for the info! I grow all of those herbs and didn’t know you can use them for a runny nose. I wonder if they are good also to reduce the mucus from a sinus infection. Ooh, I had no idea that rose was good for runny noses! One of my very favorite teas! 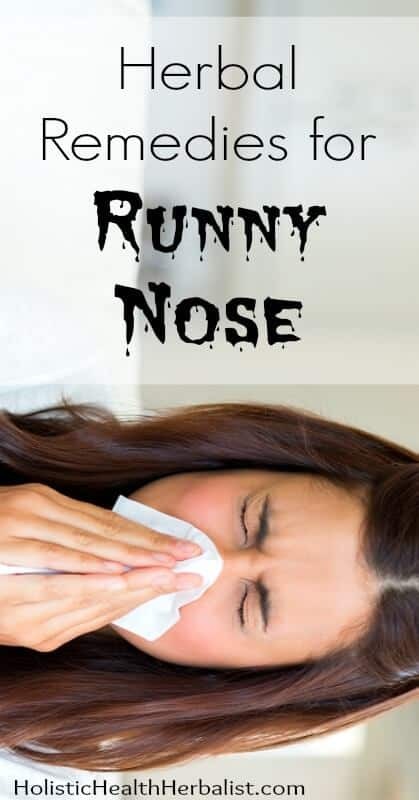 Great tips for runny nose. Of course, getting to the root of the problem and boosting the immune system are the key but the symptomatic relief with these tips are great! Just make sure to use filtered or distilled water for neti pot. We love doing the saline rinses, I never though to do an herbal tea. I am so trying that the next time we get a cold!